Presiding Officer Norma L. Gonsalves welcomed contestants of the Miss Wantagh 2017 pageant to the Theodore Roosevelt Executive and Legislative Building in Mineola. 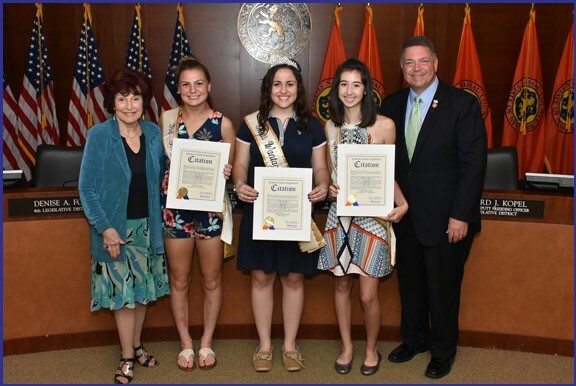 The Miss Wantagh pageant seeks a teen representative who has a desire to better her community and be a voice for her peers, while meeting officials from various levels of government. Samantha Walsh, a resident of Wantagh, was crowned Miss Wantagh 2017. Shown in photo above, left to right: Presiding Officer Gonsalves, Jaclyn Corbin, Samantha Walsh, Juliet Watstein and Legislator Steve Rhoads.